The Mumbles Lifeboat crews have been saving lives at sea for over 180 years and have been presented with 19 RNLI medals for gallantry. 1 gold, 13 silver and 5 bronze. The station has also witnessed tragedy with 18 lifeboat volunteers losing their lives while endeavouring to save others. 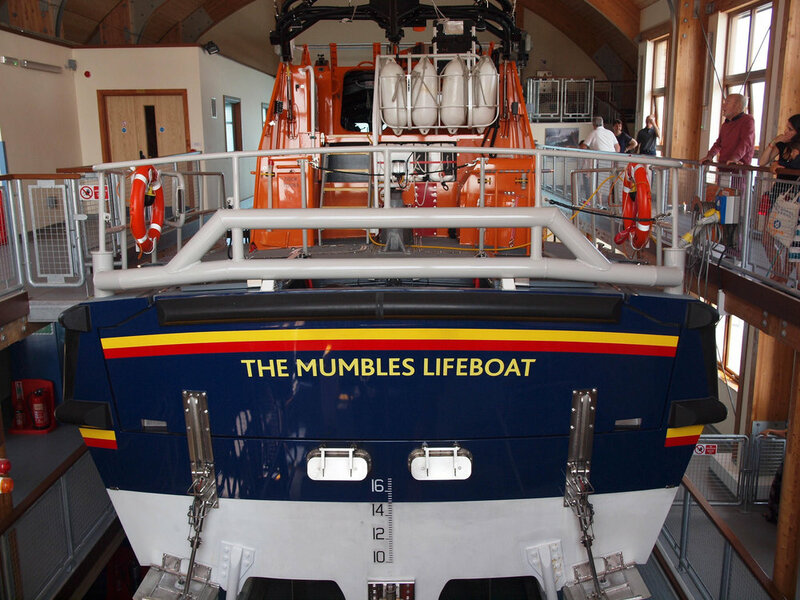 The Mumbles Lifeboat station is currently home to a Tamar class lifeboat, ON1307 Roy Barker IV and this vessel was placed on service on 8 February 2014. The previous Lifeboat House still remains along side the pier and was built in 1922. In May 1965, an inshore lifeboat station was established close by and this operates a smaller inflatable boat. From 1835 to 1866 a lifeboat was kept at Swansea, at first in the river and then in the South Dock after 1859. A new station was provided in Mumbles for the lifeboat which was far better place as the crew were familiar with local waters. At first the RNLI provided an open boat pulled by 10 oars called the “Martin and Ann”. The Duke of Beaufort gave land to build a boathouse halfway between the last houses in Southend and the Mumbles Head. The boathouse still has RNLI badge on the front of it..
A slipway couldn't be built in 1865 because Dicksons extension of the Mumbles Railway had been built. When the boat arrived in 1866 it had to be kept in a carriage in ther open. Enough Mumbles men volunteered to make up a full and reserve crew. The boats were given to Mumbles by other towns, fund raising committees like Wolverhampton. The first engine boat arrived in 1924. The RNLI regarded engine powered boats as being safer and more suitable for rescuing larger boats. In January 1883 the lifeboat went to the aid of the "Admiral Prinz Adalbert" The lifeboat was capsized three times in gale force conditions. Jessie and Margaret Ace, daughters of the lighthouse keeper Abraham Ace, with the help of Edward Hutching, pulled two crewmen ashore. They were later made women of Mumbles Head. The second disaster to strike the lifeboat took place in April 1947 when the "Edward, Prince of Wales" put out to aid the Liberty ship "Samptama" which was stranded on the rocks off Sker point, Porthcawl. There were no survivors and eight lifeboat men lost their lives. The disaster stunned not only Village of Mumbles but the entire nation.